Inside Hayloft. Photograph by Jared Sych. FOOD | Elevated prairie comfort food with a focus on local producers. VIBE | Refined, but cozy. DECOR | Vintage prairie chic. DISH | Butcher, Baker, and the Preserve Maker charcuterie board of items made in-house or by local partners. TIP | Hayloft serves breakfast daily until 3 p.m. along with its lunch menu. 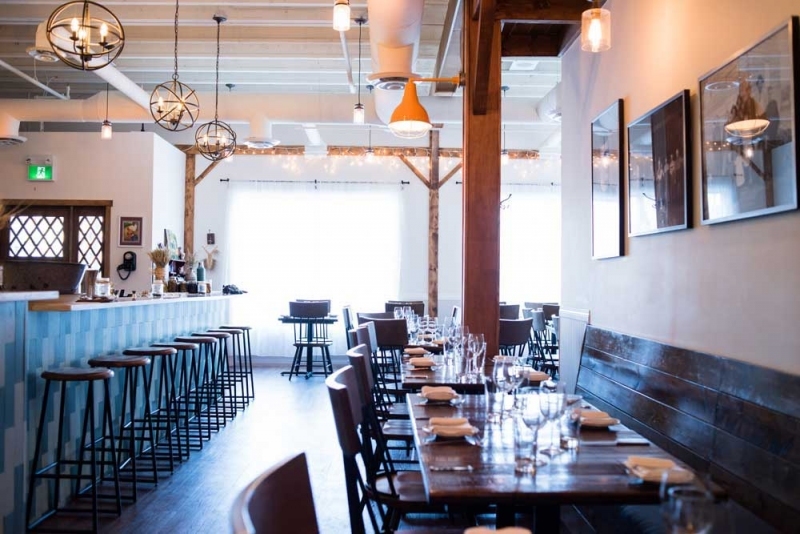 As Calgary continues to sprawl, it’s inevitable that great restaurants will extend their reach, catering to communities beyond the city’s core. While Airdrie may seem far afield (it’s a different municipality, for Pete’s sake), the pleasant drive up to Hayloft is well worth the 20 minutes or so it takes from the north end of the city. Designed to appeal to both nearby farm families and locals yearning for a higher-end experience than one would typically find in a bedroom community, Hayloft’s brand of prairie chic is a perfect fit for Airdrie. The brainchild of owner/general manager James Hoan Nguyen, working with chef Jason Barton-Browne (who get their chops from restaurants such as Teatro and River Cafe), Hayloft takes its mandate of creating quality dishes made with seasonal, locally grown food very seriously, while still creating a comfortable experience. Barton-Browne’s menu overlaps fine dining with comfort food – he can put out a perfect plate of braised rabbit agnolotti but does just as well with an order of Finnish pancakes with eggs and prairie preserves. Hayloft finds that sweet spot between uptown and down home and executes with both style and heart.